What is your minimum check-in age? We know age is just a number, but you do need to be 21+ to make a reservation and check-in at Virgin Hotels Chicago. Do you have a house car? We don’t, but give our concierge a ring during your stay, and they will be happy to call you a taxi cab, or give you directions to the closest “L” or bus stop. There are also always Divvy bikes, Ubers and Lyfts available in the area. What time is check-out? Do you have late check-out? We have flexible check-in and check-out times. Just call the front desk and we can help cater to your trip. There are no fees for early check-in or late check-out. Yes! Our expansive Chicago gym and fitness center on the 25th floor features internet-equipped Technogym® cardio machines that allow you to get stuff done while you’re getting it done. Free Wifi for all! No charging extra for bandwidth. All the WiFi, all the time. Do you have a coffee shop? Brew news! Our coffee shop, Two Zero Three is conveniently located right off of the lobby on our ground floor. Serving up delicious Dark Matter Coffee 7 days a week, 6am – 6pm. Can I have my wedding at the hotel? You can have any kind of party here! Whether you’re planning a private party, nuptials, wedding shower, or dog’s first birthday, there are all sorts of check lists needed to make your way from great idea to great event. Visit our Social Occasions page to learn more. Do you have valet? Where can I park? How much does it cost? Yes! We have a valet at the front entrance of our hotel. The cost for parking is $68 / night. There is no parking garage available on property but there are public lots throughout the downtown loop area. What’s the best way to get from O’Hare/Midway to the hotel? O’Hare: Head out on I-190 W towards Interstate 90 and 294/Chicago. Merge onto I-90 E for 12 miles. Exit at 50B toward Ohio and continue until you reach Wabash and turn right. You made it. Our valet is waiting for you. Midway: Head north on Cicero Ave and turn right onto I-55 N/Stevenson ramp to Chicago. Use the 2 left lanes to take US 41 N. Take Lake Shore Drive to Wabash. You made it. Our valet is waiting for you. O’Hare: Hop on the Blue Line towards Forest Park. Get out at the Clark & Lake Stop (only 16 stops from the airport) and head east on W. Lake toward Wabash. 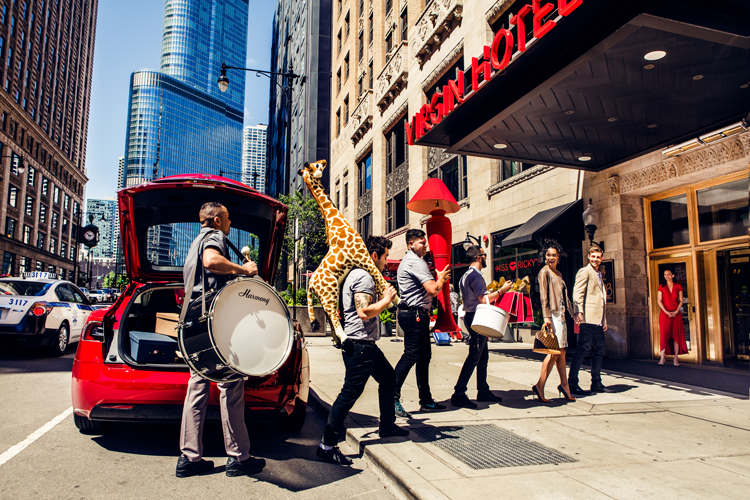 You can’t miss the Virgin Hotels Chicago entrance at the corner of Lake & Wabash. Midway: Take the Orange line towards The Loop. Get out at State/Lake (only 13 stops) and head east on Lake Street toward Wabash. You can’t miss the Virgin Hotels Chicago entrance at the corner of Lake & Wabash. We don’t. But if you’d like to take a dip in the water, we are a few blocks away from the beaches of Lake Michigan. Your best friend is more than welcome at Virgin Hotels Chicago with pet-friendly chambers and comfy pet-menities as cozy as your own. Yep, we’re big fans of the fuzz, and think traveling with pets should be just as fun for them as it is for you. No breed or size restrictions. No fees. What are Cerise Rooftop’s hours? Where can I eat breakfast? Miss Ricky’s Diner is your unicorn. And she’s here to make your dreams come true. Serving up breakfast, lunch and brunch. Located at the forefront of Virgin Hotels Chicago, Miss Ricky’s offers a delightful playful approach to every meal of the day — Just like mom used to make…if mom were a cross-dressing foodie with a full sleeve tattoo. Where can I eat dinner? Search no more. The Commons Club offers an eclectic seasonal menu, crafted by globally-inspired chef Moosah Reaume. Enjoy reinvented takes on contemporary American dishes and prepare to go on a palate journey!